Address Magic - Quickly and easily convert addresses books between many popular e-mail programs, including Outlook, Outlook Express, vCard, Eudora, Thunderbird, and Lotus Notes. 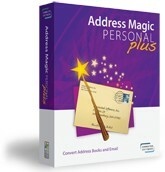 Address Magic Personal helps you convert your address books and contacts between popular email applications, including Outlook, Outlook Express, GroupWise, Eudora, Thunderbird, LDIF, vCard, Opera, Windows Contacts, Lotus Notes and more. Address Magic supports over 150 different address books fields, including email addresses, phone numbers, postal addresses, birthdays, notes and distribution lists. Address Magic has been featured in both The New York Times and the Wall Street Journal. Your purchase includes free upgrades and a 30-day, 100% Money Back guarantee. You may download Address Magic Personal for free. The functionality is limited until you purchase the software and enter the registration code. If you need to convert both address books and messages, please see Magic Personal PLUS. Boxes in a box - Boxes in a box is award winning software has been 3 years in development, and includes many features to benefit the user. myLiteDesktops - Easy-to-use windows multi desktop windows organizer software! Yak! - A serverless, text-based, chat application for use on LANs. Genie Backup Manager Pro - A simple yet robust backup solution that allows users to backup and restore.